When it comes to trucks, Honda doesn’t mess around- the 2017 Honda Ridgeline is proof. Goshen, Monroe, and Newburgh, NY drivers have yet to experience anything like this extensively redesigned, powerful model. Interested? You need to come to Middletown Honda and see this beauty for yourself. The 2017 Honda Ridgeline is Honda’a most powerful design yet. Each model is equipped with a 3.5L direct-injected i-VTEC V6 engine. It’s ability to unleash up to 280 hp is an impressive increase of 30 hp from the previous Ridgeline engine. And you can forget outdated transmissions. The 2017 Honda Ridgeline is now fitted with a 6-speed automatic alternative complete with an option of upgrading to all-wheel drive (AWD) for the first time. Two-wheel drive (2WD) models can achieve 19 mpg in the city and 26 mpg on the highway, while AWD models can achieve 18 mpg in the city and 25 mpg on the highway. * ** With such impressive efficiency scores, you’d think that the Ridgeline’s capability would take a hit- but you’d be wrong. AWD models are capable or carrying up to 1,584 lbs and towing up to 5,000 lbs. The Ridgeline also comes with a 2-inch receiver trailer hitch, 7-pin trailer light socket, and pigtail. Impressed yet? As if the 2017 Ridgeline weren’t tough enough, it also has a variety of upgrades. Unlike other truck beds, the Ridgeline’s bed features a tailgate that can be opened from the side as well as dropped down. The in-bed trunk adds to the vehicle’s handiness by offering a lockable trunk within the bed itself. Want to tailgate? Make sure to take advantage of the in-bed audio system and the bed’s plug you can fill with ice as an on-the-go cooler. 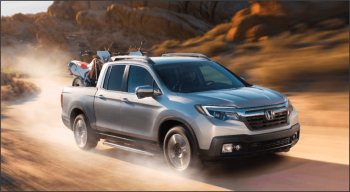 And because Honda knows you’re tough and smart, the Ridgeline is equipped with the latest advanced safety features including lane departure warning, collision mitigation braking system, forward collision warning, and more. If you’re interested in the most intense trucking experience on the market, you’re made for the 2017 Honda Ridgeline. Its redesign and new updates make it a powerful machine that’s waiting for you to break it in. Goshen, Monroe, and Newburgh, NY drivers should hurry to Middletown Honda today to meet the hit of the next tailgate. **19 city/26 highway/22 combined mpg rating for 2WD models. 18 city/25 highway/21 combined mpg rating for AWD models. Use for comparison purposes only. Based on 2017 EPA mileage ratings. Your mileage will vary depending on how you drive and maintain your vehicle, driving conditions and other factors.